Hammerhead Spearguns are one of the originators of the open-muzzle design, and the Hammerhead Evolution 2 HI-Bred Speargun is a beauty. The solid-stock mahogany barrel gives it both strength and class, so you get the ease of tracking you’d expect in a Euro-style speargun, along with the ability to overload the barrel and get a decent range without a huge amount of recoil. All up, it’s a decent speargun. The Evolution^2 HI-BRED is a perfect fusion of hand-shaped natural mahogany beauty mated to the Evolution^2 Handle, precision manufactured using 21st century technology. Inherting the best of both worlds; tracking and aiming of a Euro-Style gun and beauty and additional mass of mahogany. Hand Crafted Mahogany wood barrel with a deep semi-enlcosed track is extremely light and maneuverable. Professionally rigged with 17-4 Heat Treat Stainless Steel Shark-fin Shaft, Dual Power Helix Bands. EVOLUTION^2 REVERSE Trigger Mechanism increases band stretch and keeps the index finger on-target with the shaft for instinctive accurate shooting. The E^2 Handle also features an ambidextrous speargun safety, WJ Cut stainless steel sear, and metal injection molded stainless trigger pull and line release. Designed by Professional and Commercial Spearfishers for optimal performance and efficiency. 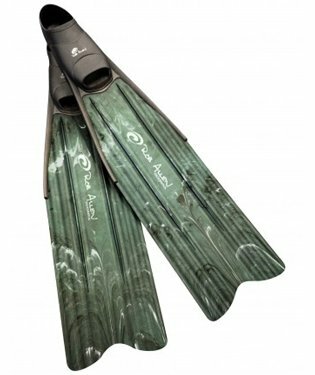 Custom modifications allowed include various Shaft/Band Combinations and Speargun Reels or Break-away. Manufactured in the USA. 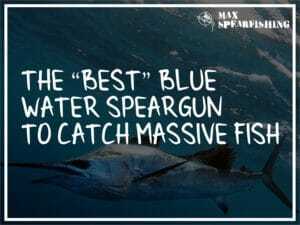 Here’s why you should buy the Hammerhead Evolution 2 Hi-Bred Speargun. As a youth in Hawaii, Kevin Sakuda graduated high school and went straight into commercial fishing. Trouble was, none of the spearguns on the market were able to deliver. Sakuda wanted a quiet gun, that would allow him to take multiple fish from a single school. So he started tinkering. Designing new fittings for his spearguns and molding them in the kitchen sink of his little apartment in Hawaii. 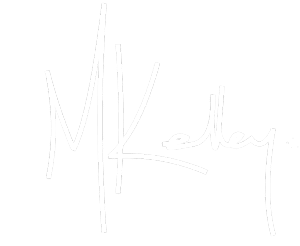 One of the main successes from these experiments was his open muzzle configuration, which after he began selling on eBay kickstarted his company. But Kevin didn’t stop there. 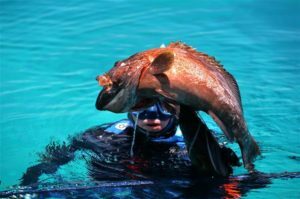 His first speargun, the Evolution, was a creation designed with the rigors of commercial spearfishing in Hawaii in mind, and they’ve continued tweaking and improving their products to this day. 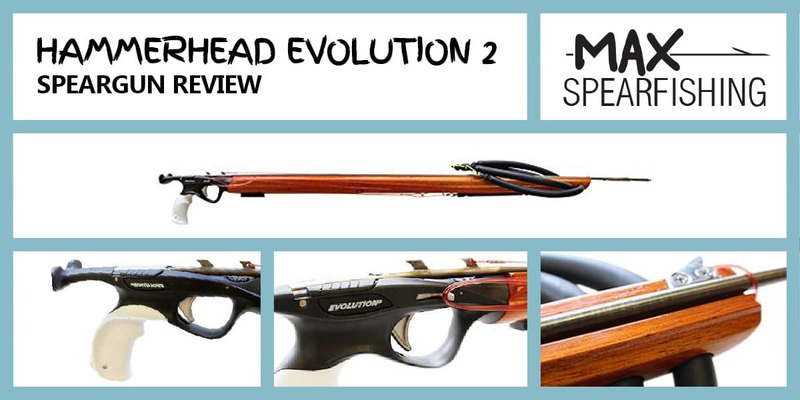 The latest Hammerhead Evolution 2 HI-Bred speargun is a great piece of tech, and what we’re reviewing today. 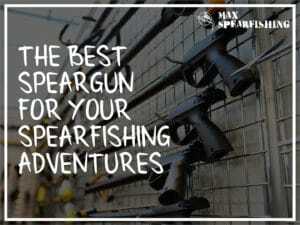 To cater for spearos at all levels, the team at Hammerhead Spearguns have a few different varieties available. The most compact model is the Proteus, which is available up to 75cm, but if you’re looking for something a little longer the Jurassic model goes up to 110cm. 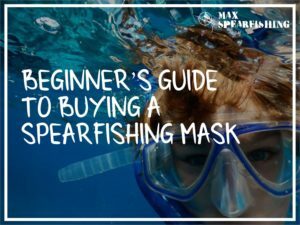 For the price, it’s a good speargun option for a beginner. Their premium models are dubbed “Evolution” and they’re currently on the second iteration of the gun. You can get a wood barrel like the one I have, or they also have a carbon barreled model. As the premium speargun in Hammerhead’s collection, the Evolution 2 is the culmination of everything their team have learned spending day after day building weapons to effectively catch fish. And it works. The cost of the Hammerhead Evolution 2 Hi-Bred Speargun will differ based on the length of the gun you want to buy. I went with the 120cm model, the largest in their range. 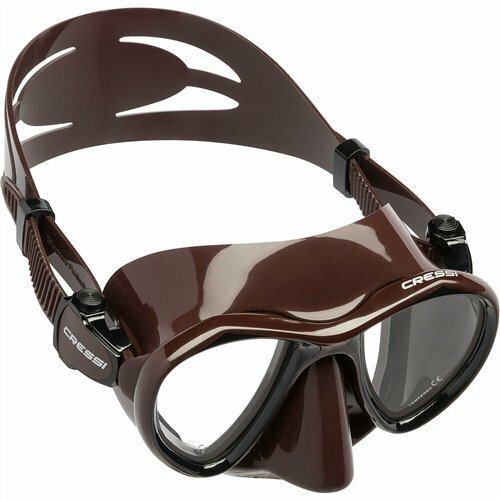 Open Muzzle with two band holes for accuracy and variable power. The ergonomic handle is one of the best features on the gun, as the pistol grip makes it easy to hang on to, and maximize your control with every shot. Underneath you’ll find a mount for the reel, and Hammerhead also have a specially designed camera mount to fit your Go Pro on. 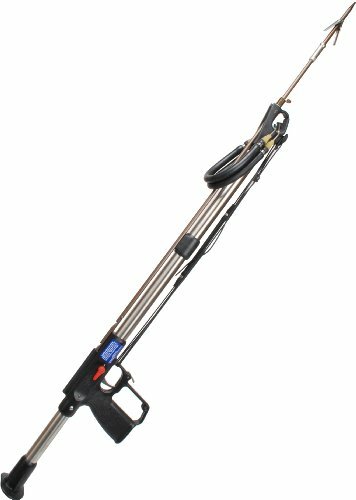 In addition to the stainless steel mechanics, the trigger has an adjustment setting that allows you to tweak it to a light or heavy pull. It’s nice to be able to adjust this so easily, as my wife can borrow my gun and as she normally wears gloves, she prefers a heavier pull. 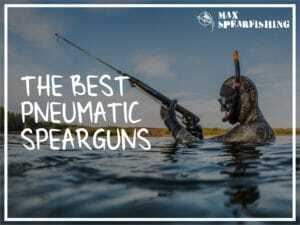 One thing that’s particularly nice with Hammerhead Spearguns is that all their shafts are made in America. Stainless steel shafts that have been heat treated, they call it a welded hydro tab, but it’s really just their version of the shark fin tabs we all know and love with our spearguns. Oh, and the stock shaft comes with a heavy-duty Hawaiian flopper. I seriously love the mahogany barrel. It’s just nice, and you can load a little more power on this gun without feeling a noticeable increase in recoil. Along the top is a slightly recessed track for the spear to follow, which is what gives it the accuracy, and on the underneath you’ll see a big stamp of the Hammerhead logo. 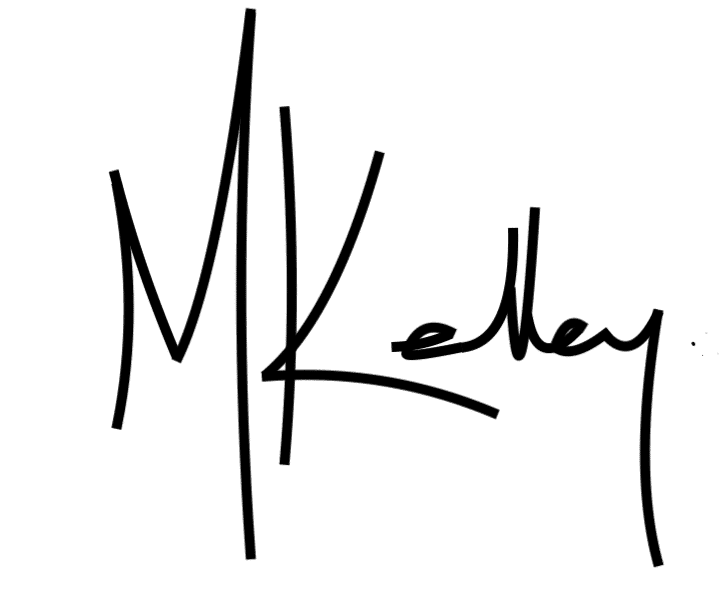 A few people have said they don’t particularly like this branding, but it reminds me of the carvings in old wooden ships, and I rather like it. If you’re into mahogany, AB Biller also do a nice mahogany speargun. To work with the shark-finned shaft, the Hammerhead Evolution 2 HI-Bred speargun uses an open muzzle like many of the Euro-style spearguns. 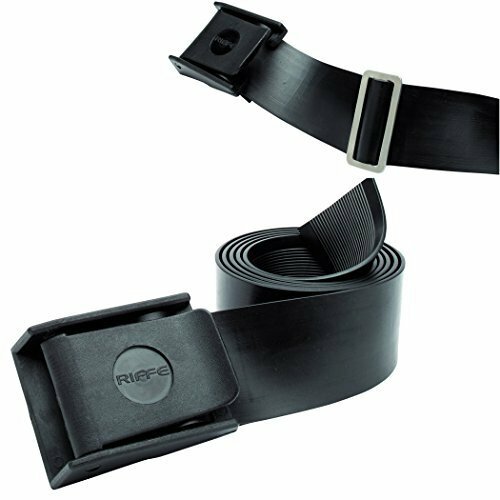 There’s two holes bored for your bands, and while it comes off the shelf with their Helix system that allows these to be easily changed, I’d much prefer a cut-out so I can swap in other bands easily without needing to retie them. 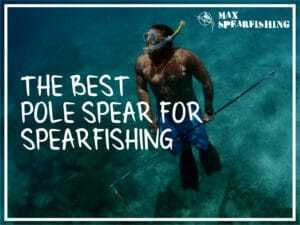 Once I got the Hammerhead Evolution 2 HI-Bred speargun in the water it was game on. Out of six shots I landed five fish, and I only missed the last as I wanted to see just how far away I could be, and in retrospect I was being a tad optimistic for the snapper that was probably 20 to 25 foot away. It’s an extremely accurate gun, but be careful if you’re planning to overload it. On my second dive I swapped out the bands for 20mm, and shortened them, and I noticed a little whip coming into the shaft that was affecting my accuracy. I’d stick with the factory settings on this one, as it looks like it’s been tuned to perfection right off the shelf. After a shot the barrel floats, and it’s got a nice buoyancy even with the spear in. I didn’t notice any significant problems with the muzzle dropping like I’ve found on other guns I’ve experimented with, and it was nice I didn’t need to make any adjustments to keep the tip up. Overall, a rather good gun that does exactly what you expect. Off the shelf it’s ready to go, and it’s a great intermediate gun when you’re after accuracy and a bigger range. 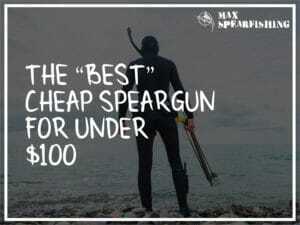 The biggest issue I have with this speargun is the price. It’s almost too expensive if you’re just getting started, and I didn’t like the fact I couldn’t overload this gun and keep the accuracy up. Despite the price, I think the Hammerhead Evolution 2 HI-Bred speargun is great if you want to buy something off the shelf, and be able to take it straight out into the water. Everything just works, which is great when you’re still relatively new to the sport. I don’t think I’ve ever shot something so accurate, straight off the rack. 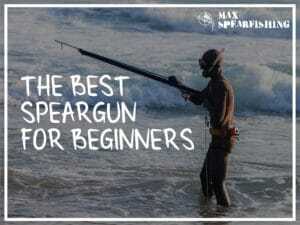 For me, it’s a speargun I’ll happily take out around the headlands, but perhaps not into the deeper blue. For all the advantages it’s simply not a big pelagic gun like Rob Allen’s Tuna Railgun. You will catch a bunch of great fish with it though, you just need to remember what I always say. Buy the right gun for the fish you’re targeting and you’ll be sweet.